Once you've chosen your baby room paint colors the next step is to work out how you will incorporate your colors in your nursery design. Too much of one color, or not enough of the other; too many different colors, or too few and your design will appear out of balance, boring or cluttered. Here are some general guidelines to keep you on the right track. To be on the safe side, keep your baby nursery colors simple with one or two main colors and an accent color or two. Keep your main colors within the same family, for instance bright with bright, pastel with pastel, muted with muted. Add interest by adding splashes of accent color from another family. For example, use muted shades of blue on the walls and add splashes of bright red around the room in the form of cushions, lamp shades etc. 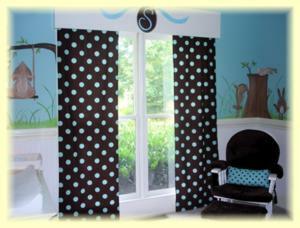 Animate the room by adding patterns of different sizes in your chosen baby room colors. To achieve a balanced color scheme stick to basic color theory principals for baby room colors. Make sure your colors are evenly spread around different parts of the room and at varying heights. When you have chosen your colors, paint samples on the wall to check how they will look in the nursery. The amount of natural and artificial light in the room can dramatically affect the perception of color. The sample chips from the manufacturers may not look the same at home as they did in store. Don't forget to consider the colors of your floor, ceiling, doors and window frames. Your baby nursery design will be made up of several major and several minor design elements. It is important to know what these are in order to allocate your chosen nursery colors among them. In the following table I have listed some of the most common major and minor nursery design elements. In general, major elements will be used to bring your main colors into the room, while minor elements will be used to bring accent colors into the room. The exception to this is upholstered furniture such as a glider which can be very effective in introducing an accent nursery color. Paint your walls with the main baby room paint color. Find major design elements in your main color or another neutral color such as oak or white. Items such as rugs, bedding and window treatments may be in your main color with detailing in the accent color. Sprinkle minor elements in your chosen accent nursery color liberally around the room. Make sure not to have your accent color all at one level or all on one side of the room. Always look for balance. An item on the left should be balanced by an item somewhat to the right. An item on or near the floor should be balanced by another item further up on the wall. This option requires a bit more thought in terms of balance. Make sure that each color is spread evenly around the room. For instance a red rug should be balanced by another red element higher up in the room otherwise the eyes will always be drawn down towards the floor. Paint your walls with the main color. Find major design elements in your main color or another neutral color such as oak or white. Items such as rugs, bedding and window treatments may be in your main color with detailing in one or both accent colors. Choose up to three of the minor design elements per accent color. Make sure to balance them out as above. The rest of the minor design elements should be in your main color or another neutral color such as oak or white. Paint the bottom half of the walls in one main color, and the upper half in the second main color. Separate these two halves with a border in a neutral or accent color. Paint three of your walls in one color and the fourth "focus wall" in the second color. This is a very effective approach in a bigger nursery room. Paint your walls with one color and use the second color in a border around the middle of the room or just below the cornices. Paint your walls in one color and use major design elements such as window treatments, furniture and rugs to bring in the second color. As a general rule, whether you use one or two paint colors you should not introduce more than four of the major design elements in any one color. The others should be either neutral or in your second color otherwise your design will feel cluttered. Introduce your minor elements in your accent color(s) as above. In the case of two main colors you may use one or both of these colors as your accent colors too. As always, pictures of baby rooms are your best source of information. If you find a design you like but you don't like the colors, work out the main and accent colors of the design and replace them with your own. Check out this brilliant book I use: The Smart Approach To Baby Rooms, by Joanne Still. It's literally jam-packed with beautiful, inspirational baby nursery photos. You are sure to find something in here to get the brainwaves moving. 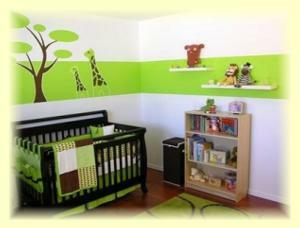 This page is just a general outline to give you some ideas for mixing and matching your nursery colors. There are as many ways to mix and match as there are mothers-to-be! The most important thing is that your design is balanced and uncluttered and that you have fun! For more baby nursery color tips click here.